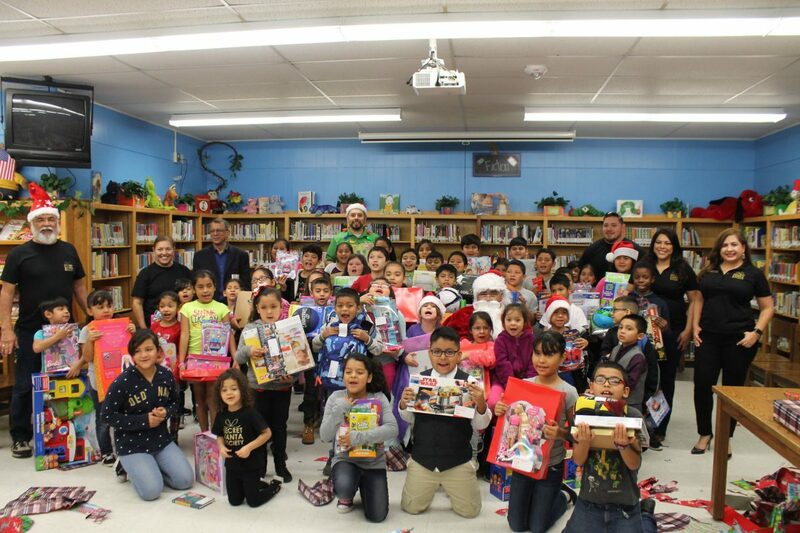 Seguin Elementary School students scrambled to find their presents during the Secret Santa Society distribution held at the school library on Friday in McAllen. 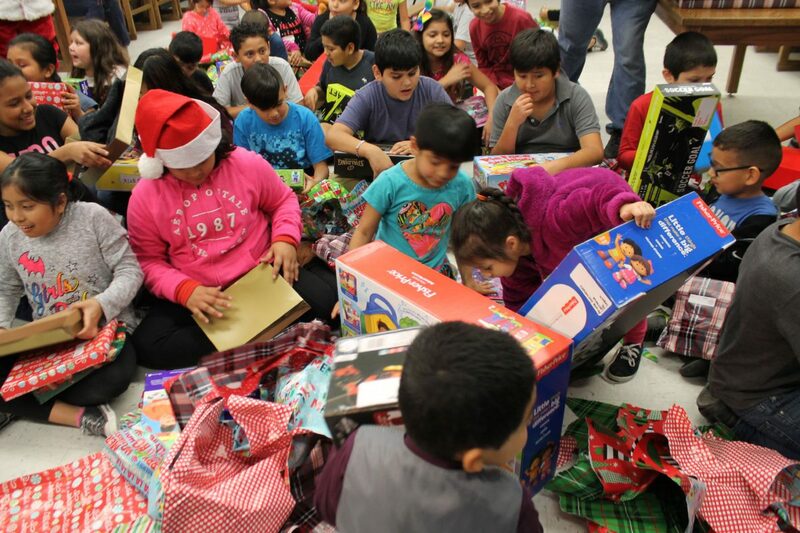 McALLEN — Before beginning their winter break, students at Seguin Elementary School received a surprise Friday as the Secret Santa Society made one last stop to deliver presents. About 50 students from pre-kinder to fifth grade walked into the school library and found several tables covered with wrapped presents. Each was labeled with the student’s name, grade-level and teacher’s name. The children were eager to find their gift, but first they had to wait for Santa’s arrival. Once St. Nick walked in, teacher and Secret Santa Society founder Diana Ballesteros explained the details and told the students that each table was by grade-level. Once Ballesteros gave them the permission to find their gift, they scrambled across the library finding their designated table and the scavenger hunt for presents began. 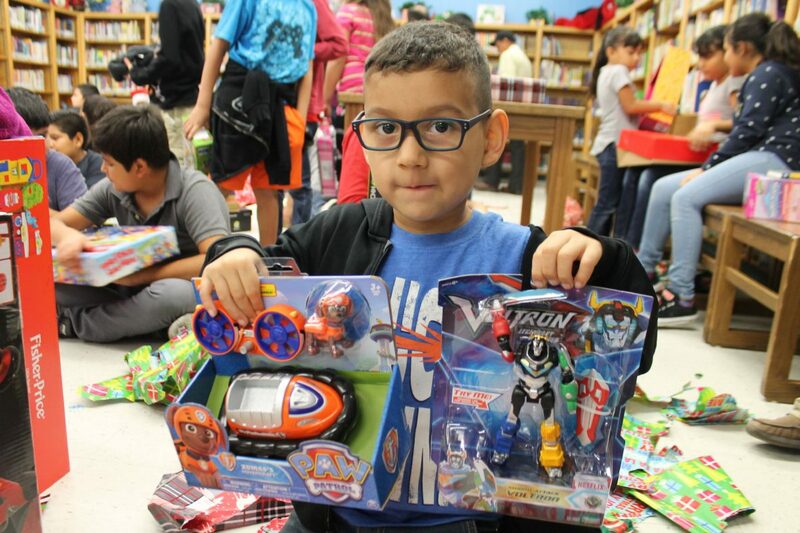 Pre-kindergartener Noah Aleman shows off the presents he received during the Secret Santa Society distribution held in the library on Friday in McAllen. 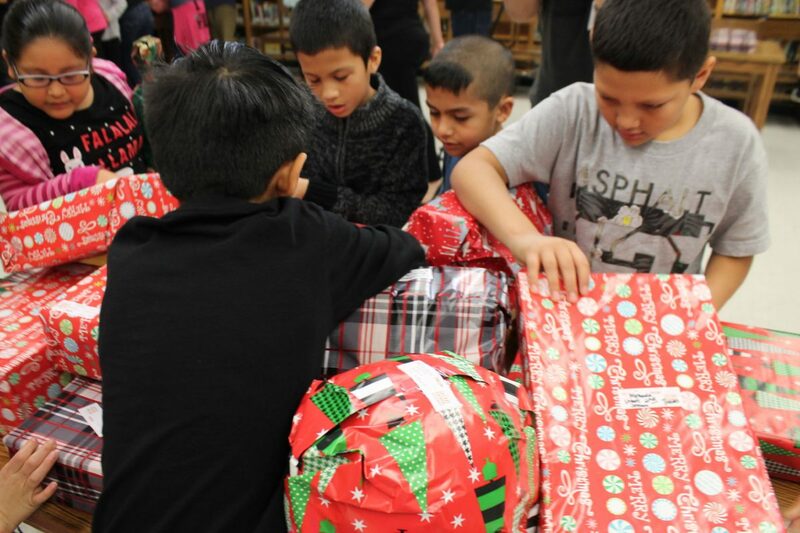 Seguin Elementary School students were eager to unwrap their presents at the Secret Santa Society distribution held in the library on Friday in McAllen. The Secret Santa Society began in December 2011 from a conversation between an anonymous donor and third-grade teacher Ballesteros, who has since became founder and president of the organization. That first year Ballesteros chose 12 students from fifth-grade and asked them to write a Santa letter. “I went shopping one Saturday and wrapped the gifts at home, brought them and called the kids separately to receive the presents,” she explained. It became an annual tradition to provide Christmas gifts to the less fortunate children. About two years ago, the project was transitioned into a nonprofit organization. Ballesteros became overwhelmed with emotion when discussing the project she created because not every child is the same. Not all of the wish lists include toys. Melissa Barrientos, secretary of the Secret Santa Society, said one of the students asked for a wall. “There are multiple families living in the home, so she asks for a little bit of privacy,” Barrientos said about the student’s request. Another student asked for a wagon to assist their mother when she goes grocery shopping because the mother walks to the grocery store. Some of the other more traditional requests were for Lego sets, Barbie Dolls and Star Wars figurines. The organization has since grown into 12 school districts across the Rio Grande Valley and consists of nine in Hidalgo County and three in Cameron County, totaling up to 600 Valley students. School districts that want to participate in the Secret Santa Society must apply by October. An admission letter must be done by a counselor, teacher or administrator from the school. The process begins shortly thereafter with brainstorming and planning until the project’s execution in mid-December. In addition to the holiday distribution, the organization also holds a school supply drive over the summer. They are also seeking donations to assist students in purchasing school uniforms. For more information on the Secret Santa Society, visit their Facebook page.